Disclaimer: I received a complimentary copy of this book from Andrews McMeel Publishing via NetGalley in exchange for an honest review. Pearls Before Swine is delightful comic strip that has run in US newspapers and online since 2000. It features a cast of anthropomorphic animals (a pig, a goat, a rat, a zebra, a duck and a fraternity of dumb crocodiles) who each represent different aspects of the author's personality. It's reminiscent of Peanuts and Calvin and Hobbes in its sense of whimsy, especially in poor, naive Pig's efforts to cope with the harsh world around him, but Pastis' sense of humour can get a little darker at times. The darker strips are almost always to do with Rat's misanthropic schemes. It's a bit like Dilbert, only with fewer jokes about work and a lot more terrible puns, stupid crocodiles and dead zebras. The title of this particular collection appealed to me as a home educator. It comes from a plot arc (insofar as Pearls has those) where Pig builds a space ship and tries to persuade Timmy, the neighbour's kid to come to space with him and enjoy life now instead of studying too hard and missing out on his childhood in the hope of a better life later. Sometimes I think Pig has it all figured out. This collection focuses more on the warm and fuzzy stuff than the adult jokes about work, and darker strips about death and terrorism. Presumably that's because it's a marketed as a children's book, when normally Pearls Before Swine can be found in the “humour” section of bookshops. If you prefer the whimsy over the more controversial strips this book will probably appeal to you more than most of the Pearls collections. 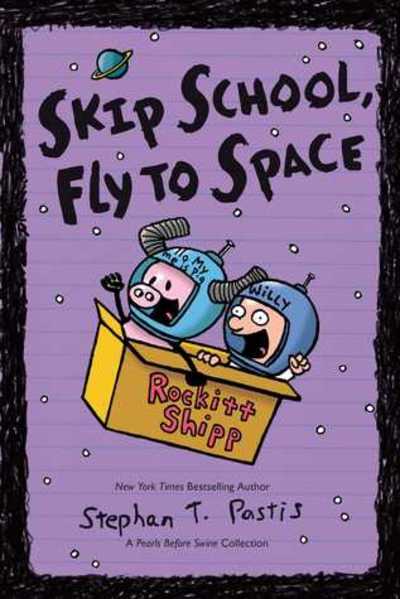 Skip School and Fly to Space is a fun little book that is suitable for children, but would also be great for adults to read during coffee breaks at work or any other time you're feeling a bit down or stressed out.